Contents of Volume 64. Contributors. Preface to the Third Edition. Preface to the Second Edition. Preface to the First Edition. Principles of Cytometry and General Methods: A Brief History of Flow Cytometry and Sorting, M.R. Melamed. Principles of Flow Cytometry: An Overview, A.L. Givan. Laser Scanning Cytometry, L.A. Kamentsky. Principles of Confocal Microscopy, J.P. Robinson. Optical Measurements in Cytometry: Light Scattering, Extinction, Absorption, and Fluorescence, H.M. Shapiro. Flow Cytometric Fluorescence Lifetime Measurements, H.A. Crissman and J.A. Steinkamp. Principles of Data Acquisition and Display, H.M. Shapiro. Time as a Flow Cytometric Parameter, L. Seamer and L.A. Sklar. Protein Labeling with Fluorescent Probes, K.L. Holmes and L.M. Lantz. Cell Preparation: Preparation of Cells from Blood, J.P. McCoy, Jr.. Cell Preparation for the Identification of Leukocytes, C.C. Stewart and S.J. Stewart. Strategies for Cell Permeabilization and Fixation in Detecting Surface and Intracellular Antigens, S.K. Koestner and W.E. Bolton. Standardization, Quality Assurance: Stoichiometry of Immunocytochemical Staining Reactions, J.W. Jacobberger. Standardization and Quantitation in Flow Cytometry, R.A. Hoffman. Cell Proliferation: Methods to Identify Mitotic Cells by Flow Cytometry, G. Juan, F. Traganos, and Z. Darzynkiewicz. Cell Cycle Kinetics Estimated by Analysis of Bromodeoxyuridine Incorporation, N.H.A. Terry and R.A. White. Flow Cytometric Analysis of Cell Division History Using Dilution of Carboxyfluorescein Diacetate Succinimidyl Ester, a Stably Integrated Fluorescent Probe, A.B. Lyons, J. Hasbold, and P.D. Hodgkin. Antibodies against the Ki-67 Protein: Assessment of the Growth Fraction and Tools for Cell Cycle Analysis, E. Endl, C. Hollmann, and J. Gerdes. Detection of Proliferating Cell Nuclear Antigen, J.K. Larsen, G. Landberg, and G. Roos. Lymphocyte Activation Associated Antigens, A. Fattorossi, A. Battaglia, and C. Ferlini. Cell Death/Apoptosis: Analysis of Mitochondria during Cell Death, A. Cossarizza and S. Salvioli. Cytometry of Caspases, S.K. Koestner and W.E. Bolton. Analysis of Apoptosis in Plant Cells, I.E. Weir. Difficulties and Pitfalls in Analysis of Apoptosis, Z. Darzynkiewicz, E. Bedner, and F. Traganos. Cell-Cell, Cell-Environment Interactions: Analysis of Cell Migration, N.D. Zantek and M.S. Kinch. Three-Dimensional Extracellular Matrix Substrates for Cell Culture, S.L. Voytik-Harbin. Three-Dimensional Imaging of Extracellular Matrix and Extracellular Matric-Cell Interactions, S.L. Voytik-Harbin, B. Rajwa, and J.P. Robinson. Cytometric Analysis of Cell Contact and Adhesion, M.S. Kinch. Invadopodia: Unique Methods for Measurement of Extracellular Matrix Degradation in Vitro, E.T. Bowden, P.J. Coopman, and S.C. Mueller. Index. Volumes in Series. Each chapter presents a detailed background of the described method, its theoretical foundations, and its applicability to different biomedical material. Updated chapters describe either the most popular methods or those processes that have evolved the most since the past edition. 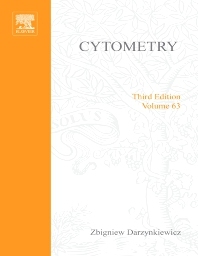 Additionally, a large portion of the volume is devoted to clinical cytometry. Particular attention is paid to applications of cytometry in oncology, the most rapidly growing area. Scientists, technicians and graduate students in basic research, industry, and clinical medicine. Whitehead Institute for Biomedical Research and Massachusetts Institute of Technology, Cambridge, U.S.A. Cell and Molecular Biology Group, Los Alamos National Laboratory, New Mexico, U.S.A.